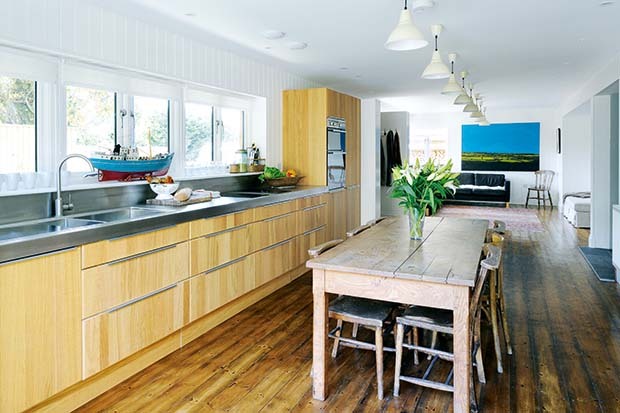 Guy and Nina McNair-Wilson have transformed a World War II cabin, deep in the New Forest National Park, into a stylish single storey home. 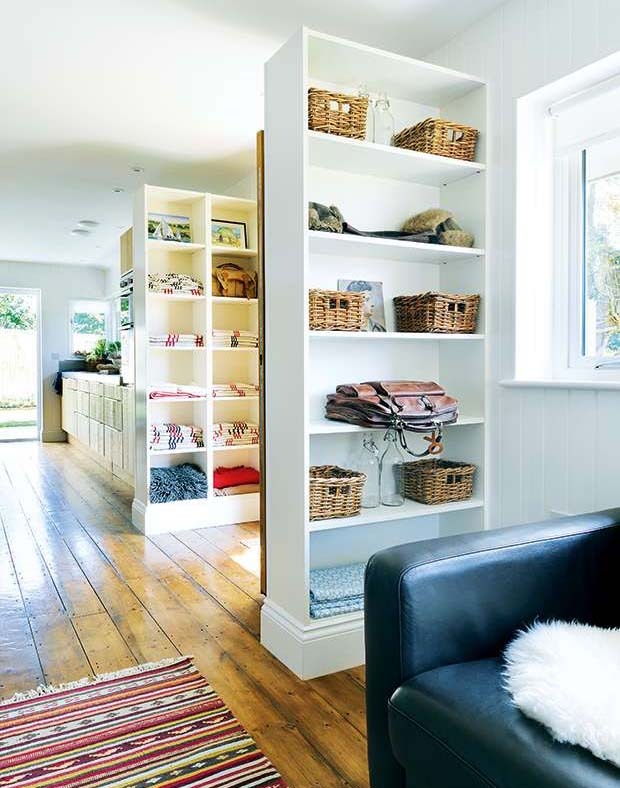 Planning restrictions meant they could not build much beyond the existing footprint, so architectural designer, Guy, called on his best space-saving ideas to build a family home which did not feel cramped. With wild ponies making the occasional visit to the front gate, this oasis among mature trees is undoubtedly a special spot, but the ex-military prefabricated cabin which sat on the small 402m² plot was not without its issues. It had been lived in, but there was no insulation in the building and it sat on brick with no foundations. However, Guy and Nina were won over by the idyllic location in the midst of New Forest woodland. They purchased the property in December 2011. The building had a certificate of lawfulness in its existing state and had been used as accommodation when it was built, to serve military aircrew during World War II. But this meant a renovation project (rather than a knock down and rebuild) would have to be the order of the day. Guy’s design ideas included introducing a small rear extension under Permitted Development rights. They hoped to then restore and update the cabin, being both faithful to the original, but also ensuring it was suitable for modern living. Unfortunately, after work had begun the project was bought to a halt by the storms which wreaked havoc on the southern coast of England in early 2012. The existing timber frame front elevation of the, complete with its windows and doors, fell down in the weather. This put the project on hold for eight months: the house was now deemed a new build by the local authority, and the couple had to apply for planning permission for the work. 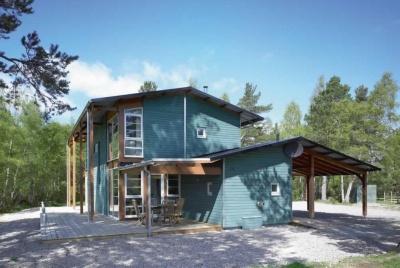 Under the National Park policy, they were allowed to build up to 100m², so Guy design a new build home measuring 84m² with a 16m² outbuilding. The final plans fortunately remained much the same, and it’s the clever and thoughtful design details which really are key to the success of the resulting home. 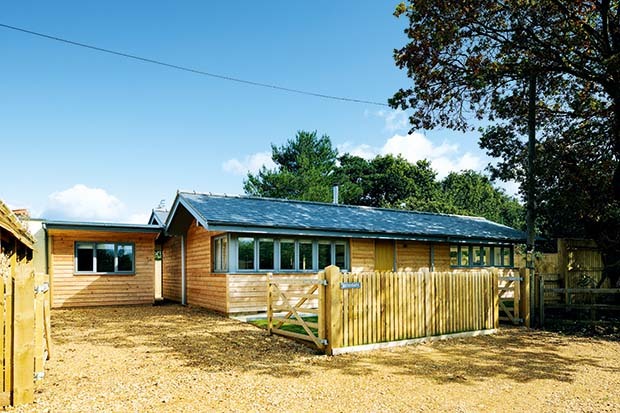 Features such as the wraparound corner windows and the 700mm overhanging eaves, for example, mark this building out from being just an ‘ordinary’ bungalow. Thought has also been given to future flexibility. 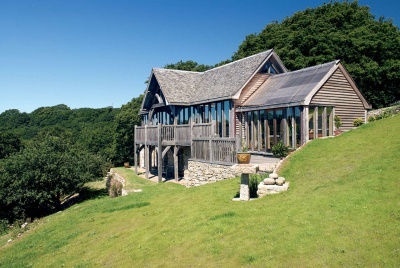 The double-pitch trussed roof is supported by a central steel beam, which runs the length of the property, and by steelwork at the four corners; all the internal walls are built in masonry, but are non-loadbearing as a result and so the layout could be moved if needed. Making every inch of space work hard was imperative. To this end, Guy and Nina have kept circulation space to a minimum, and the three bedrooms can be accessed via a small lobby off the open plan living area. 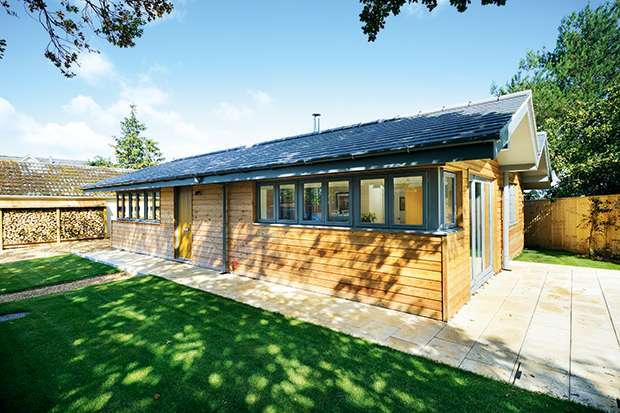 The outbuilding provides room for an office, extra bathroom, and also a utility where the noisy washing appliances can be kept away from the hub of the home. Another ingenious solution is the bookcases which have been carefully positioned either side of the front door in the open plan kitchen, dining and living room. They provide definition between the living area and kitchen, but also act as a porch, protecting the large room from gusts of wind as the door is opened, and a spot to hang coats. 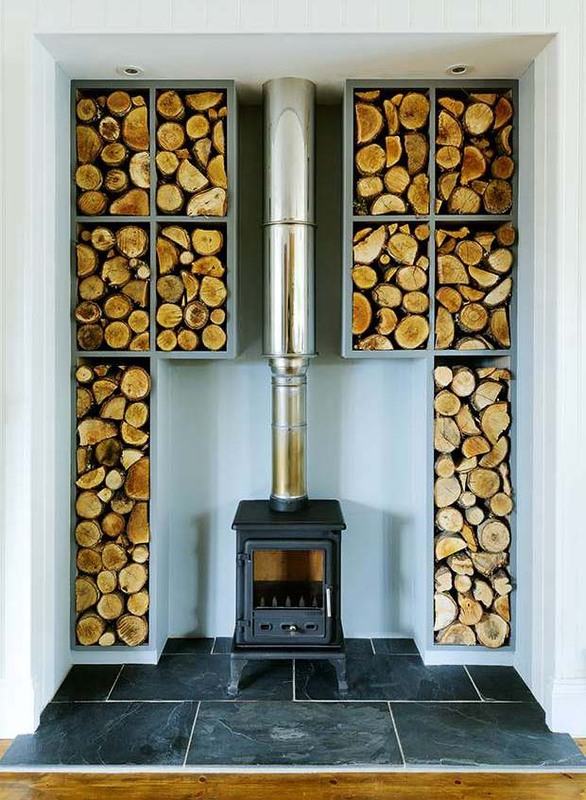 The interiors, with their reclaimed pine floorboards, walls lined by tongue-and-groove cladding, and a central woodburning stove adorned by full-height log stores to either side, also take their cue from the wooded surroundings. 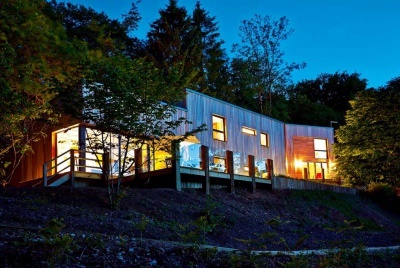 Indeed, Guy admits that a ‘wood theme’ deliberately runs throughout this project with Siberian larch cladding the exterior — a natural choice of materials for a home set in woodland. 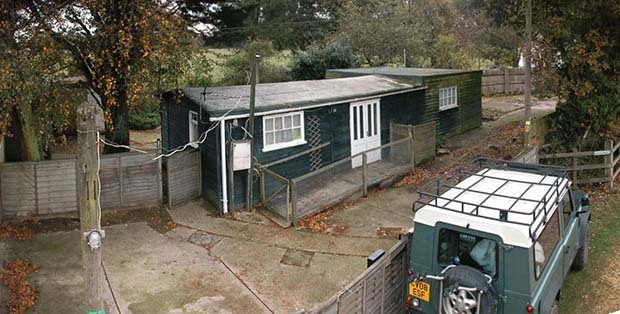 Situated in a quiet corner of the New Forest National Park, the building is both off mains gas and drainage. A new sewage treatment plant was required, but due to the small plot and high water table careful planning had to go into creating a soakaway (with two underground water pumps) which would not back up in wet weather. The couple specified LPG gas, which had to be reinstalled after heavy rain caused the underground tank to rise out of the ground. 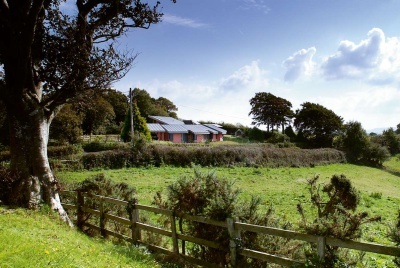 They also have a Hyundai generator which means that the property is almost self-sustaining — a big advantage in an area where power cuts are a frequent occurrence. After the initial disaster of the collapse in January 2012, the home went up fairly quickly when work resumed. The new build commenced in September of the same year and was finished by February 2013. Most of the external walls are constructed in blockwork (and reassuringly sit on reinforced trench-fill foundations — a far cry from the bricks on which the cabin was originally built). All that is, except one: the front elevation is timber frame. The end result is a masterclass in how to create a small but perfectly formed home.